American goldfinches are one of the latest nesting birds and young fledge in late summer when there is an abundance of seeds. 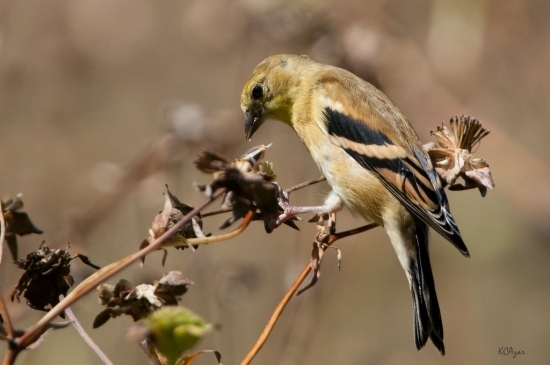 This summer and fall at Goose Pond Sanctuary, goldfinches have been feasting in our prairie restorations on ox-eye sunflower, sawtooth sunflower, prairie dock and pasture thistle. The seeds of the first three species are members of the sunflower family and have a seed in quality like the commercial sunflowers. Sometimes it is a race to collect prairie dock seed for future restorations before the goldfinches devour all of it! Most of the prairie seeds have been eaten or dropped at this point, and now the goldfinches have set their sights on our bird feeders that contain sunflower fines. We're grateful to customers from Mounds Pet Food Warehouse stores that have provided bird seed for our feeders through the “Buy a bag of birdseed for Goose Pond Sanctuary” program - next time you visit Mounds, be sure to inquire! Goldfinches are numerous at Goose Pond due to our prairie restorations, shrub and tree cover units that provide nesting and roosting cover, and bird feeders. Goldfinches are usually the second most numerous birds at our feeders with the mourning dove being most numerous. If you have a yard with good shrub and tree cover, consider adding a bird feeder with sunflower seeds to attract winter finches to your space. Of course, planting native sunflowers will also bring more birds to your yard as well! On previous Christmas Bird Counts we observed hundreds of goldfinches on DNR sunflower food plots on state wildlife areas. Next spring we plan to plant eight acres north of Goose Pond to a “large” wildlife food plot, including three to four acres of black oil sunflowers! We are gearing up for Christmas Bird Counts and look forward to counting flocks of American goldfinches and to seeing them at our feeders this winter. We will also be looking closely for pine siskins that feed with goldfinches - keep your eye out for these tiny birds as well, which can be identified by their striped breast!